Bring on Big Time Fun! 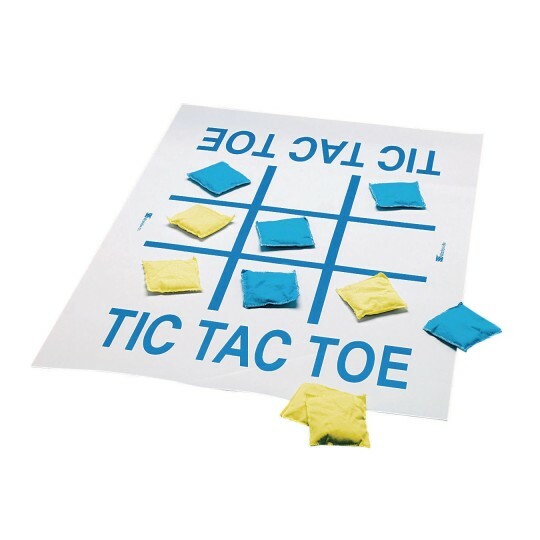 Giant Tic-Tac-Toe played with beanbags! Washable printed vinyl game board. Measures a whopping 27" x 36". Place it on a table or floor. Bring on big time fun with our giant Tic-Tac-Toe game that's played with beanbags! Washable printed vinyl game board is 27" x 36" and can be placed on a table or floor. Includes 10 beanbags and instructions. Beanbag colors may vary. This is a perfect game for everyone in our community. We have so much fun and it is easy to clean and easy to move. Great we have a lot of fun with it. We use it for fun games in the community. We bought this to use at our spring carnival. It was an inexpensive game to have at the carnival. The kids loved it. They played alone or head-to-head. It held up well and was easy to clean. i stored it back in the box it came in for next year. Will be using again and again I am sure.